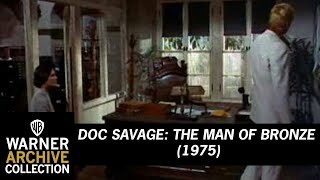 as Clark 'Doc' Savage Jr. In the Fabulous Thirties, Doc Savage and his five Amazing Adventurers are sucked into the mystery of Doc's father disappearing in the wilds of South America. The maniacal Captain Seas tries to thwart them at every turn as they travel to the country of Hidalgo to investigate Doc's father's death and uncover a vast horde of Incan gold. You can buy "Doc Savage: The Man of Bronze" on Apple iTunes, Microsoft Store, Chili, Google Play Movies, YouTube as download or rent it on Apple iTunes, Microsoft Store, Chili, Google Play Movies, YouTube online.